Horizon Fitness has always been a company that focuses quality and customer satisfaction. The Horizon T101-04 Treadmill model is certainly no exception to their standards of quality. This is a fantastic mid tier priced treadmill that offers a fantastic opportunity to get in shape without completely breaking the bank! The Horizon Fitness T101-04 also offers the user great control over the intensity of the workout, which means that this treadmill will help to improve your health no matter what your current fitness level is. The Horizon Fitness T101-04 comes with many advantages to other treadmills that make it a much more realistic option for many customers. This treadmill features a foldable design that makes it very easy to transport into smaller rooms or apartments. It also comes equipped with an extremely quiet motor, making it an even better option for apartment residents that do not want to wake up their neighbors. 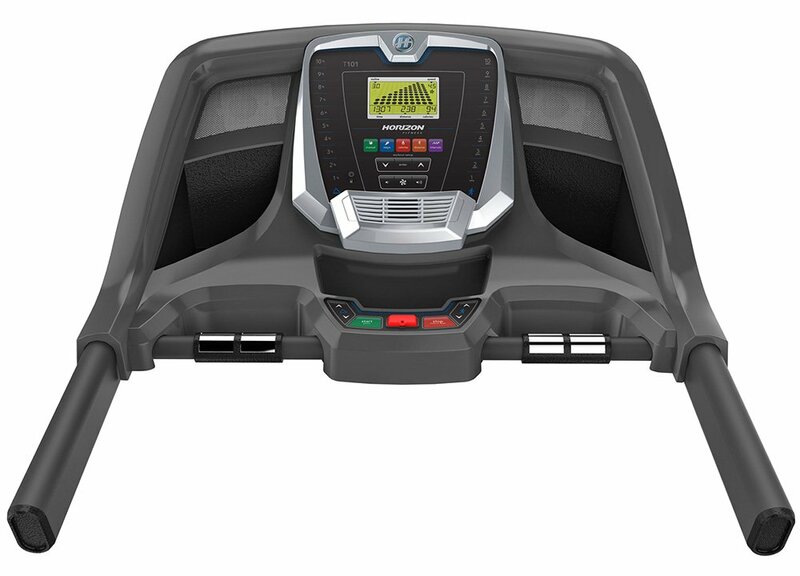 The significantly reduced motor noise also helps to highlight another great feature of this treadmill; built-in speakers. No workout is complete without some energetic music to keep you motivated, and Horizon Fitness has done everything in their power to make this possible. This treadmill also comes pre-loaded with several workout options based on your specific exercise needs. These programs work to get you in shape and keep you in shape through monitoring several training statistics. The T101-04 also comes with a heartbeat pulse detector, so you can maintain and work to improve your heart rate and the overall health of your heart. While several other treadmills can be found with similar features, few are offered at such an affordable price. This makes the Horizon Fitness T101-04 the most versatile treadmill on the market today. Its price range, size, and mobility make it a fantastic option for anyone looking to get in shape, regardless of budget or housing space. While this treadmill has many pros, it does come with a few cons of its own. These are relatively small in comparison to its advantages, but must still be considered to make an informed decision about your purchase. Perhaps the most noticeable of these minor flaws is that after significant wear has been out on the machine, the engine is likely to become louder. This would not be a concern for those living in a house, but apartment residents may find this to be an issue. There have also been several reports of the machine wobbling when it reaches its top speeds. The wobbling itself is typically very minimal but may unsettle some users. In most cases, this can be fixed by tightening screws near the belt. After weighing the pros and the cons, the Horizon Fitness T101-04 is certainly a workout machine that is worth purchasing. Everything from its foldable design to the long list of pre-programmed workout routines makes this a treadmill that can be enjoyed and used by nearly everyone. This extreme versatility and user friendly interface comes at an affordable price, compared to many of its competitors that can cost upwards of one thousand dollars. While there are some isolated issues with the noise reduction system, it is still not enough to rule this treadmill out as a viable option. Overall, this is a product that I would recommend to anyone who wants to improve their physical condition while at the same time saving money and being considerate to others who may live close by.